Jamie Hitel was born in Southend-on-Sea, England, to a British mother and Hungarian father. Jamie’s early musical education began at the age of 6. At the age of 14 he became Organist and Choirmaster of St Alban’s Church, Westcliff-on-Sea. 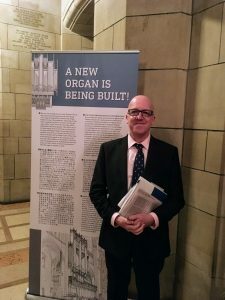 After leaving school Jamie won an Organ Scholarship to Cambridge University, where he studied organ with David Sanger, James O’Donnell and Peter Hurford. Upon graduating he became Director of Chapel Music at Robinson College, where his responsibilities included directing the Chapel Choir, conducting orchestral concerts, and leading international choir tours. After leaving Cambridge Jamie worked as an organist and choir director in the Lutheran Church of Norway. His official duties involved traveling between churches by boat. It was during this time that Jamie wrote and recorded two stage musicals. Jamie Hitel returned to England to become Director of Music at Waltham Abbey, where his eminent predecessors included Thomas Tallis and W. H. Cummings. He developed and expanded the music program, maintaining a busy portfolio of services, concerts, broadcasts and recordings. During his time at Waltham Abbey, Jamie’s increasing focus on solo work won him recitals across the UK and Europe, as well as a place in the finals of the prestigious Franz Liszt International Organ Competition, Budapest. As a diploma recipient, his performance of Poulenc’s Organ Concerto was broadcast live on Hungarian Radio. In 2000, Jamie Hitel was appointed Director of Music at St Paul’s Episcopal Church, Akron, USA. He directed separate choirs of men, boys, and girls, embracing a full schedule of tours, workshops and recordings. He founded a mixed-voice auditioned choir, produced several commercial CD recordings, and led multiple tours to England, including performances at Hereford Cathedral, Exeter Cathedral, and St George’s Chapel, Windsor. Jamie’s solo career continued to develop through the release of a new organ CD. Featuring the work of Olivier Messiaen and César Franck, Sounds Messianic is the first commercial recording of the 4-manual organ at St Paul’s Episcopal Church. It is currently only one of a few available recordings of Messiaen’s complete organ cycle Les Corps Glorieux. Jamie Hitel was appointed Director of Music at Christ Church Greenwich in 2008. He runs a busy program, directing the Choir of Men & Boys, the St Cecilia Choir of Girls, the Christ Church Singers, and several other ensembles. Jamie is founding director of the Schola Cantorum, comprising advanced auditioned teens and professional men. Other groups under his supervision include the St Nicholas Choir (for children in grades K-2), the Christ Church Bell Choir, and the Christ Church Compline Choir. Jamie became an American citizen in 2009. In his spare time, he enjoys long-distance running, having completed two full marathons and three half marathons.